The founders were careful to place Oakwood above the sometimes turbulent confluence of the two Trinity Rivers and yet in a place close by that included majestic sight lines to the city, the bluffs and the rivers. They could not have anticipated the growth of Fort Worth or the evolution that would cast the city with Oakwood still almost in the middle. Now their care in locating Oakwood , and the continuous attention to maintaining its warmth and dignity and elegance will soon be enhanced as Fort Worth prepares to extend its central area to the southern limits of Oakwood. Fort Worth is building for the future with an innovative plan to carefully redevelop the long ignored area from just under the historic Courthouse on the bluffs to a point a few yards south of the Oakwood fences. 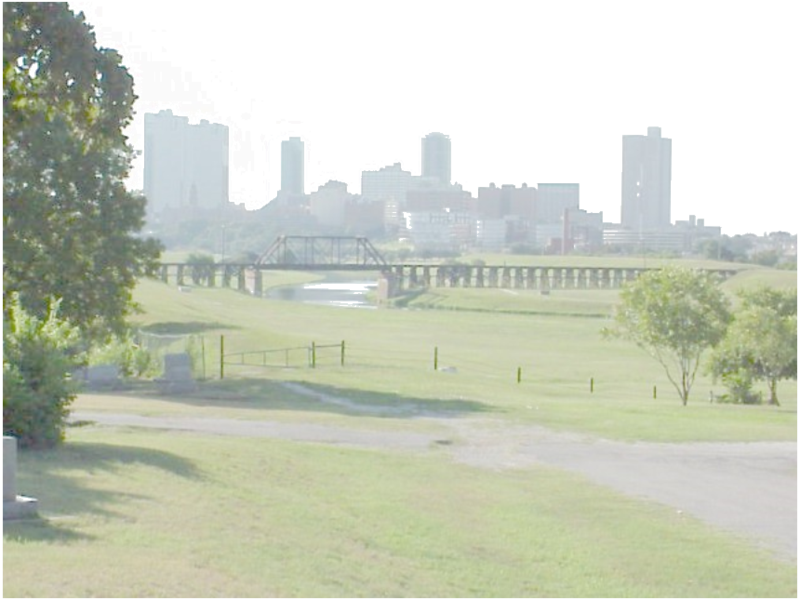 This is the Trinity River Vision …. and in a few years a carefully planned mix of green spaces, rivers, small lakes, residences, academic institutions and businesses will flow north. And at the apex, with the new vision for Fort Worth enhancing the view while embracing its historical past , stands Oakwood..